Retailers are looking for new ways to expand their business nowadays. It is very difficult to reach the audience effectively. If you want to make a good impression of your business, you may have to use popular media among them. Social media is one such tool retailers can use to promote their business online. There are various social media platforms and more than 80% of people uses any of the social media platforms. If you can impress this crowd, it can be very useful for your business improvement. 90% of consumers look into social media while they take the buying decision. Retailers can use this chance to explore various options to market their products online. Retailers back few years were creating websites for their business. But this is not the condition right now. Now they are using social media platforms to promote their business. You can personalize consumer purchase experience, build a good relationship with customers and build a good community that can be your brand advocates and many more using social media. 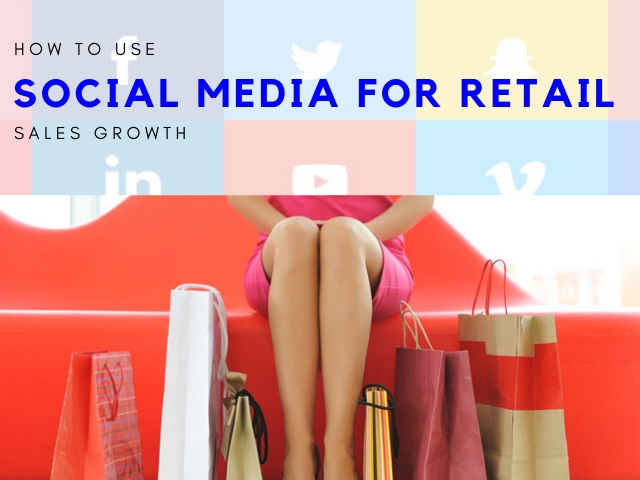 If you are looking for new ways to expand your retail business then try to expand your retail social media marketing. It is like a new tool that can be used to interact with customers directly. This article will help you to get some effective options to make your social media marketing successful. Also, you need to know your audience well before marketing the products. Your audience might be located in various demographics and sometimes they are from different age group. Know the type of audience you are going to sell the product. It will help to create personalized strategies for a particular audience which is very useful in the current marketing situation. Analyze your products and service for its unique features. When you market a product you always want to show the unique features of the product. It can help the product to stand out among competitors. Create a social media team to organize your social media marketing. A good team can keep all the social media task in a planned and organized way. If you can put together all your efforts after analyzing the market and form a team of talented people who can market your brand well on social media can be very useful. Every marketing needs proper planning and analyzing the audience and market. You can create various social media profiles and listen to your audience for their communications. A well-developed strategy with good content can help you to build social media followers and thereby improve your business. Just by creating social media profiles you cannot improve the sale. You have to post useful contents and analyze how your followers react to these posts. There could be a positive and negative response for every post. You will get a clear picture of what your audience wants from your products and their feedbacks about it. It can only be possible by actively listening through these social media platforms. Improve social listening skill by monitoring social mention of your business in various social media platforms. Sometimes users may not type the brand name correctly. You have to monitor various sources where someone mentions your brand name. You cannot expect your customers to tag everywhere whenever mention your products. You can also reach out to your customers to know their opinions about your products. Encourage them to include their feedback below your products. Do you know the facts that more than 75% of customers look for reviews online before buying a product? What if your brand got negative feedbacks? You need to handle the negative feedbacks in a polite manner. Negative feedback is not a bad thing. You will get to know what you can change to make your customers like in your products. Reply to these comments in such a way that says you can resolve their issue as soon as possible. Don’t direct them to contact your website to resolve that issue. It is not at all professional. No need to avoid neglect positive comments. You can thank customers who say positive things about your products. By improving social media listening skill you know what to offer to your customers to make them happy. Customers are always happy if they know that a brand is listening to what they have to say and will support such brands. At the same time if a brand really cares for its customers then it needs to incorporate social media listening skills as a part of their marketing strategy. Offer good discounts and deals via social media to your loyal customers. It will encourage more customers to visit your page and interact with your posts. You can also conduct online and offline programs for your customers to participate. Some brands tell their users to feature their product and post on social media. They also conduct competitions and reward the winners. All these are a very good way to engage customers on your social media page. By following the brand’s social media pages, customers will get many discounts and coupons. It can be very useful for them to trust in your brand and be your brand advocates. TJMaxx and Marshalls are two great retailers who used user-generated contents for their business promotion. They encouraged their customers to post pictures featuring their products and post it on Instagram or Twitter with relevant hashtags. By doing this you are engaging your customers. Moreover, they will get a feel of contributing to your business growth. If your business has various branches then you need to promote through social media accordingly. If your business has a branch in Chicago, Florida and New York you must produce local contents for each city. This is very crucial for your business success. Geo-specific contents are very important to attract the local audience. You can use social media to produce contents for each city and personalize it for the audience. The audience always enjoys personalized messages. You can do it by using built-in targeting features. Even if your business has the only location then personalizing it for the audience is very useful. Know the community around your business and promote it accordingly. By researching your audience you can develop new strategies that can make them attractive to your business. One more important thing you can try is to engage with the local community in conducting various socially relevant programs. Customers always support a brand who will work with them in local events and programs. If your business sells sporting goods you can sponsor some products or money for a local sporting game. It can create a good brand name in the community. You can also support good social causes that happen in a local community to create good brand credibility. Social media advertisement plays a very important role in influencing the buying decision of the audience. More than 45% of in-store purchases are the result of digital interaction of the audience. Most people see those ads on their mobile devices. Facebook ads are very popular in his category. You can offer customized ads for people according to what they want through social media ads. Dynamic ads are very helpful to customize your advertisements. You can give better customer experience by offering products available in their local store with their price. Product availability may vary in each store and you can customize your ads based on local inventory, price, and promotions. Dynamic ads will help you to store the available products to the user in their local store with its price. The product list varies from customer to customer based on the availability and their location. Real-time updates can be shown through these ads. If a particular product is no more available it can be customized in your ad easily. Connect with your audience and create a good branding using social media advertisement. Visual elements are more powerful than any other types of contents. It is proven that including videos in the landing page can improve the conversion rate up to 80%. Visual storytelling is a market trend right now. You can include more visual elements and encourage the audience to buy your products. Use social media platforms such as Facebook, Instagram, snapchat, etc to create visual stories and publish them for your audience. User stories and brand stories are very famous nowadays. Brands can use their background stories to publish on social media platforms for the promotion. 75% of internet traffic is from video content. Focus on visual storytelling through Instagram, Snapchat and all other platforms to connect with the audience. Give them interesting offers and feature them with your products. Many companies tried this and succeeded in their strategy. When real customers get featured in your business promotion, it can create more impact than promoting using advertisements. Text updates and promotions are very old and won’t work out as you expect. Try promotion using visual element and see how it can change your product value in the market. Everyone tries to advertise their business nowadays. In this competitive world, how can you make your brand stand out? It is very important to use unique strategies to promote your brand on social media platforms. Brands have to invest more time in creating their strategies. They have to bring social media trends to their marketing campaigns and connect with their audience through it. You can check Lowe’s and Nordstrom campaigns. We can say that they are using social media effectively to reach to their targeted audience. To bring more customers in-store they consistently use new strategies and experiment them on the audience. Their social media marketing team invests their time in creating new innovative strategies to promote the brand on social media and measuring the result. So, if you want to be successful in your marketing campaign it should have something special, compared to all other brands. Now you got a clear idea on using social media properly in retail marketing. Get started with your strategies and see how it can change your business. To make your business more profitable, consider your customers and offer the best for them. These are some important social media promotion options for retailers. So many opportunities are out there to make a business successful nowadays. If you can find the right opportunity and use it properly you can be successful in business. Customers always trust a brand which can make them happy by offering a good quality product with offers and discount. You can use these customers like your brand advocates in social media. Featuring their experience with your products on social media is very useful in increasing your business. A brand which cares their customers can easily win the market and be successful. In addition to your brand’s quality offer some promotion through social media platform for better ROI.